When I met Maureen I wondered how long it would take for the seed of our friendship to germinate. Each seed has its own period of readiness; if it doesn’t sprout and grow roots within a certain length of time, the embryo inside will die. A maple, for instance, needs to take root within two weeks while a lotus plant can remain dormant for two thousand years and still spring to life in an instant under the right conditions. It seems to depend on the thickness of the seed coat, that protective barrier that keeps nourishment from reaching the inside. A thin seed coat needs only water and light to initiate growth while a thick coat needs something called “scarification”, any process of breaking or scratching the skin to make it permeable. Farmers have learned that they don’t have to wait on nature to soften seed coats, they can scarify seeds by soaking them in concentrated sulfuric acid. But this is a dangerous practice, particularly for the inexperienced. Vinegar is safer but it’s far less effective. I, however, knowing so little about farming, am reluctant to force anyone’s growth, so I wait. I had told Maureen early on that I wanted to know her. I felt an immediate connection with her and I imagined our late night phone calls, the endless discussions of movies and theater and politics and books and relationships. I had hopes that she would become the sister I never had and always longed for, that we might develop an unspoken bond of siblings where whole worlds are contained inside of momentary glances and stifled laughter. She said that she was a little afraid of me, that it wasn’t so easy for her to expose herself, that maybe she needed, “I don’t know, wine, pot, time” to soften the barrier that kept her so hidden. I halfheartedly joked that I would not wedge myself into the cracks too quickly but that I’d bring wine, pot and time with me when I visited. I sat across from her and she melted in an instant as if she had always been waiting to do so. I asked her intimate questions that she readily answered despite her discomfort. She said she trusted me and seemed to feel unburdened as she allowed her deepest feelings to reach out for air and sunlight. But each seed has only a limited amount of energy. If it is buried too deeply and expends all its energy before reaching the surface, it will not grow. Though I would prefer not having to wait two thousand years for our friendship to take root, I think of Maureen as a lotus plant. I sense that there is an astonishing flower within her that wants only to burst forth and fully open. The lotus is the only plant to fruit and flower simultaneously after it emerges from the muddy depths of a swamp or pond and reaches the waterline. It is this ability to rise above the darkness that makes humans, throughout millennia, equate the lotus with the Buddha Nature or Christ Consciousness. 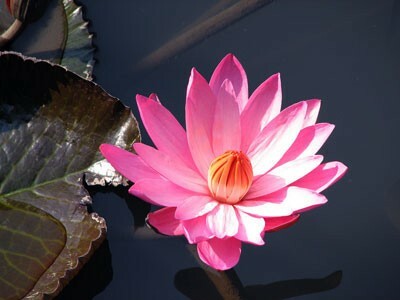 Lotus blooms, which open at night, are considered sacred and have the highest vibration of any flower. To use their essence as a natural therapeutic treatment encourages a gentle unfolding of one’s potential. But what encourages the gentle unfolding of the lotus? Under what conditions does the thick skin of the lotus seed give way to its own growth? These are questions I wish I could ask my new friend but she’s retreated into silence, perhaps even dormancy. And because I am unfamiliar with the care and feeding of this particular plant, it’s hard for me to tell if it’s germinated and growing, but simply hasn’t flowered because it’s still in its first year of life. I’ve asked around. Everyone who knows about its tender habits and sense of timing says that to be patient with the flowering lotus is well worth the wait. So I do my best to remain optimistic. I don’t have a lot of plants in my garden, I don’t collect them and discard them at will, what I have has been carefully chosen and all of it well tended. I like that friendships, the good ones, must be cultivated and nourished, weeded and fertilized, and even sometimes clipped back to encourage new growth. My friendships, the good ones, are vital to me because it is through my friends that I feel myself connected to a larger whole. Naturalist John Muir once said, “When one tugs at a single thing in nature, he finds it attached to the rest of the world.” I wonder if the opposite is true: if I tug at the world, will I find it attached to Maureen? I am reluctant to try in case John Muir is wrong, and in case the roots of this friendship are too fragile to sustain tugging. I once had a profoundly sad experience with a gardenia plant. My grandmother liked gardenias best, their delicate white flowers, their gentle, pleasing fragrance. I never met my grandmother, she died before I was born, but through my mother’s stories of her I have always felt her strong presence nourishing my ecosystem, the way that dead trees in an old growth forest enrich the soil and provide sustenance for the next generation. At the nursery, I chose a hardy gardenia with tight flowers poised to bloom. I read the instructions carefully and kept moving the budding shrub around the yard until I had settled on the perfect location. As soon as I removed it from its pot and put it in the ground, it died. I didn’t know that gardenias flourish in acidic soil, which apparently mine wasn’t. I didn’t know that it’s best to keep them in their own container where you can closely monitor the condition of the soil. The gardenia is notorious for needing considerable maintenance. Nonetheless, I was heartbroken. There’s a responsibility I feel to the planet when I make the conscious decision to acquire and care for one of its offspring, and after the death of this particular gardenia, I felt as though I’d failed at something basic and had let my grandmother down. It was hard realizing that her representation wasn’t going to be a part of my life either. In these months of silence, I’ve asked myself, how had I failed Maureen? What part of her soil did I neglect to understand and nourish? Sometimes it feels silly caring so much. Like when I pulled the gardenia out of the ground by its dead roots. It’s just a gardenia. There are a hundred more all lined up on the shelf at Home Depot. The truth is, I was afraid that it would happen again. Even if I tended the soil, even if I fertilized with blood meal, even if I supplemented with plenty of organic matter, it was entirely possible that I could do everything right and still not be able to raise a gardenia to maturity. Plants are unpredictable. Despite the volumes of information written about each genus and temperature zone, a plant has its own life cycle, its own requirements, its own habits. And not only am I limited in my skill, I’m also limited by outside forces beyond my control. The neighbor’s dog, for instance, kept jumping over the fence and peeing on the lavender, the roses, the forsythia, the calendula. Dead spots appeared in the grass. After months of random urination, only the cactuses remained green and healthy. I hadn’t know about the athletic ability and bladder capacity of the dog next door but when I finally witnessed it myself, I resented that all my hard-earned work could be shat upon in an instant when I wasn’t looking. Oh, the silence of the plant kingdom. All of this could have been avoided with a little better communication. Which brings me back to the flowering lotus. Apparently, as they develop, these miraculous plants filter and purify the surrounding water, sometimes even making it transparent. Some people believe that the more muddy the water, the more beautiful the flower will be when it arrives. Now that’s something I’d like to see.